Our fast pitch softball bats come in 10 different models. Per ASA rules, all softball bats are identical from the transition through the 2 1/4" barrel. The differences are in the handle thicknesses and knob styles. The thinnest handle, 7/8", is found on the Model 59. Model 41 has a medium 15/16" handle. Model 61 has a thicker 1" handle. Model 71 has a medium flared handle and Model 73 has a medium flared handle with a large knob for better balance (lighter swing feel). ASA Models have the ASA logo engraved on the barrel and the handles on the ASA 41, 59 and 61 are straight to the traditional knobs. The X Bat Girl's youth softball bat Model 59 is a long barreled bat with a long handle transitioning to a quick taper. Handle is a thin 7/8″, small knob, and the barrel is 2 1/4″. Weight range is from -7 to Even. All X Bat softball bats are made from the same hard maple that over 300 Major Leaguers say is the hardest wood bat made anywhere today. The X Bat Girl's youth softball bat Model 73 is a long barreled bat with a long handle transitioning to a quick taper. We took the most popular handled baseball bat model and are the first to bring it to a softball bat. It has a tapered medium sized 15/16″ handle flaring to a very large knob, and the barrel is 2 1/4″. The large knob gives the bat exceptional balance and makes it feel lighter and easier to swing, especially for players accustomed to aluminum bats. All X Bat softball bats are made from the same hard maple that over 300 Major Leaguers say is the hardest wood bat made anywhere today. 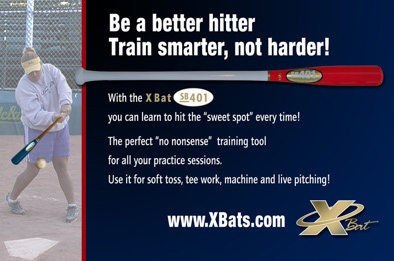 The SB401 Fast Pitch Softball Training bat was developed by former 11 time National Champion UCLA Softball Player and Coach and Softball Hall of Famer, Sue Enquist. This training bat has a very short barrel with a small sweet spot. It is designed to be used for short toss and tee drills to help the player develop a short, direct, hands inside the ball baseball type swing rather than the long loopy swing many softball players have. By keeping the hitters hands inside the ball, they can develop more power and wait a little longer on the pitch and hit the outside pitch to the opposite field, a feat not possible with a long rotational swing. The SB401 softball training bat is currently being used by over 80 Division I Softball programs and is an integral development tool to any players daily regimen.